I have the best job in Manchester and it’s a real privilege to meet visitors from all over the world and guide them around our fascinating city. I was describing Manchester Town Hall in Albert Square, waxing lyrical about the neo-gothic architecture, the political scene in the city at the time of its construction, how all Mancunians are proud of our city and especially the Town Hall, considering its one of the finest buildings of its type in the world. “Just down the road at Granada TV studios”, I replied. “Great, let’s go there next“, and she jumped in the back of the taxi. Just in case you have never heard of Coronation Street, it’s the longest running soap opera in the world and has been filmed in Manchester since its inception in 1960. 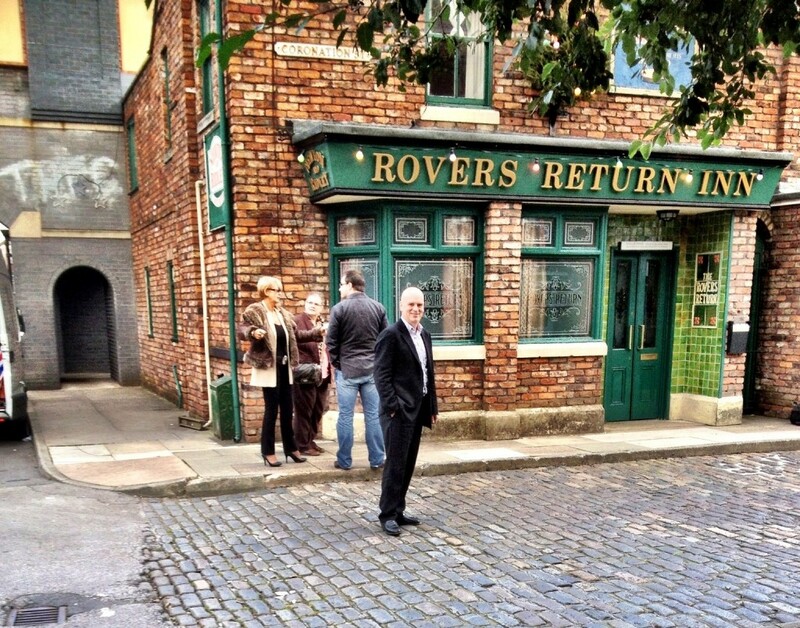 (Since the tour in question, Coronation Street has moved to a brand new set on Media City). The show is a drama about life in the North of England, it’s gritty, warm, humorous and addresses many social issues. I’ve been lucky to appear as an extra on the show, which when I told my client, raised me to superstar status! Back to the tour – “Now John, where did Tony try to drown Roy?” She was referring to a scene when a particularly nasty soap villain tried to murder one of the stalwarts of the show. “Castlefield, just round the corner” I responded. To which she replied: “Let’s go, I love Corrie”. Manchester was first settled by the Romans in AD 79 and Castlefield, at the confluence of rivers Irwell and Medlock, provided an easily defendable position for the Roman fort. The area became the UK’s first Urban park in the 1980’s and a reconstruction of the Roman Wall shows the size of the fort. The Bridgewater Canal, Britian’s first purpose built industrial waterway, terminates in Castlefield. This takes us back to the 1760’s to the start of the Industrial Revolution and one of the main reasons Manchester became the world’s first industrial city. More importantly for Coronation Street fans though, Castlefield has provided the backdrop to many of the storylines and features in the credits. After visiting the real Coronation Street, Rovers Return, Red Rec, Salford Quays and St. Mary’s church we ended up at ‘Annie’s’ in Manchester city centre, a bar owned by Jennie McAlpine who plays a character called ‘Fiz’ in the show. Jennie is one of the nicest people you could wish to meet and much to my customers’ amazement, she’s there! “I cannot believe it” she gushed as they pose for photos.